The FPM-8200 Fiber Optic Power Meter was designed for general purpose precision power measurements from fiber optic sources and components. The 8200 features a 75dB dynamic measurement range with a measurement accuracy of 2.5% traceable to NIST calibration standards. 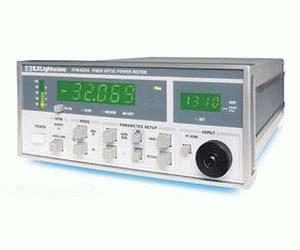 In addition to precision power measurements, the FPM-8200 is loaded with standard features such as log/linear display modes, auto-ranging, relative measurement mode, and save/recall functions for storing and retrieving instrument con?gurations. These features plus an analog output proportional to measured power and an IEEE GPIB interface combine to make the FPM-8200 a versatile laboratory or production test instrument.